Eastern gorillas are divided into two subspecies – the mountain gorilla and eastern lowland (or Grauer’s) gorilla – both of which are larger and have blacker fur than the western gorilla. Mountain gorillas have longer fur and are slightly smaller than eastern lowland gorillas. Males of both are much larger than the females, and develop the characteristic “silverback” as adults. Dominant silverbacks lead groups of on average ten individuals and often many more. They spend much of their time on the ground, and build nests to sleep in, mostly on the ground, or in the lower branches of trees. There are thought to be at least 1,000 mountain gorillas, and the population has been increasing in recent decades. There are no reliable estimates of eastern lowland gorillas, but the declining population is thought to number as few as 3,800. Mountain gorillas are split into two populations in the montane cloud forests of Uganda’s Bwindi Impenetrable National Park, and the Virunga Volcanoes on the Uganda, Rwanda, DR Congo border. 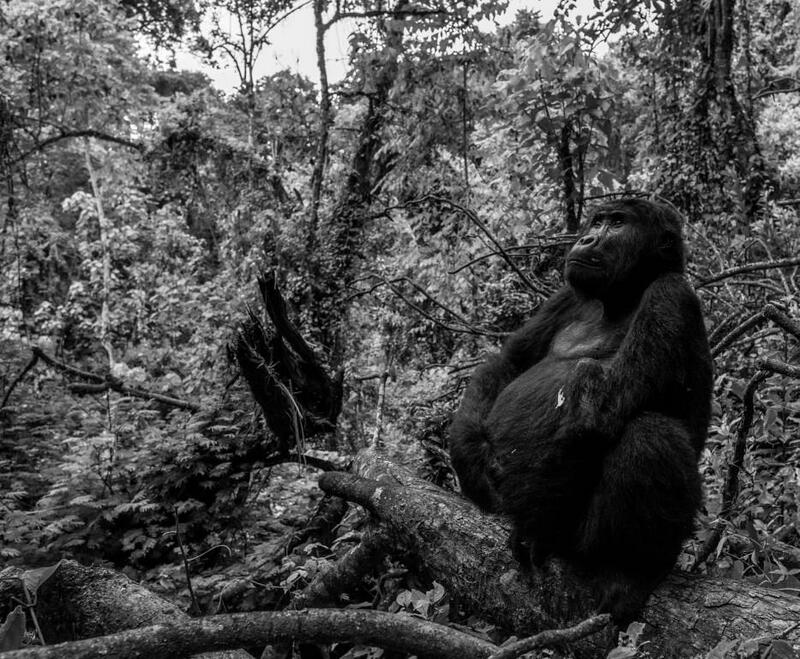 Eastern lowland gorillas are endemic to the mountainous forests of eastern DR Congo that have suffered heavily from armed conflict over the past couple of decades. Eastern gorillas are almost entirely herbivorous. Mountain gorillas eat plant stems, pith, bark and roots with favoured plants including wild celery, bamboo, nettles and thistles. Eastern lowland gorillas and Bwindi mountain gorillas eat more fruit, and all populations will occasionally eat insects such as ants and termites. Eastern lowland gorillas have been hunted for their meat during the conflict in eastern DR Congo and from the occupation of their habitat by artisanal miners. The extraction of resources and civil unrest has also reduced and degraded their habitat. Mountain gorillas are also threatened by some of the civil unrest, and all populations are threatened by disease transmission from humans. Protection of eastern lowland gorillas is extremely difficult because of the insecurity in eastern DR Congo. Tusk supports the efforts of the Pole-Pole Foundation and Gorilla Organization’s Walikale Gorilla and Forest Conservation Project in preventing illegal activity and hunting over part of their range. The increase in the mountain gorilla population has been a conservation success story thanks to high levels of protection of the gorillas and their habitat, and the gorillas’ value for tourism. Nevertheless, so few still remain that they remain critically endangered. Tusk supports Conservation Through Public Health’s efforts to protect Bwindi’s mountain gorillas and prevent disease transmission from humans.